The rainbow eucalyptus is an unusual tree with a beautiful trunk. The trunk periodically sheds a strip of bark, revealing a green layer underneath. This layer then changes colour. The shedding and colour change happen at different times in different parts of the trunk. In addition, a variety of new colours are produced. The overall effect is lovely and gives the tree its "rainbow" name. We're used to beautiful colours in the flowers and fruits of trees and in their autumn leaves, but a coloured trunk is an oddity. The rainbow eucalyptus is greatly admired and is often planted deliberately, either for its appearance or for its other benefits. It's an interesting and impressive tree. 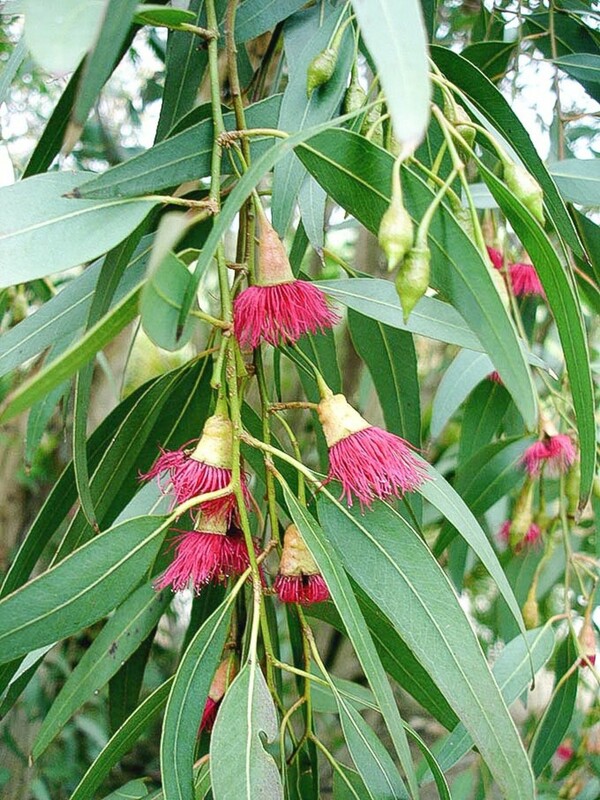 All eucalyptus trees and shrubs belong to the genus Eucalyptus, which is in the myrtle family, or the Myrtaceae. The plants are native to Australia, Tasmania, Papua New Guinea, Indonesia, and the Philippines. 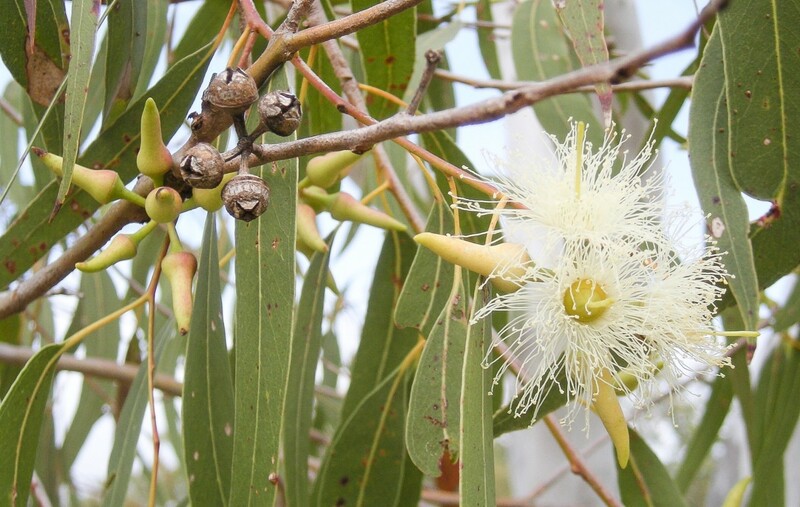 Most grow in Australia, which contains hundreds of species of eucalyptus. Eucalyptus trees are very popular and grow as introduced or cultivated plants in many parts of the world. The rainbow eucalyptus (Eucalyptus deglupta) is native to the Philippines, Papua New Guinea, and Indonesia. It's also known as the Mindanao gum tree after the island of Mindanao in the Philippines. Gum trees are a group of eucalyptus species which have a smooth bark that is periodically shed. The main component of a koala's diet is eucalyptus leaves. Rumour says that koalas sleep so much due to the influence of the eucalyptus oil in their diet. In reality, the digestion of eucalyptus leaves requires a lot of energy and provides limited nutrition. By sleeping up to twenty hours a day, koalas reduce their energy expenditure. The multicoloured trunk of the rainbow eucalyptus is a unique and highly appreciated feature. Green, orange, yellow, rusty red, maroon, brown, purple, and blue areas may all be visible on the trunk. On some trees the colours are so vibrant and rich that they look artificial. On others the colours have a pastel hue. People who would like to grow the tree should be aware that the colours are often much less intense when the tree is growing outside its native habitat. The colours of the trunk change as patches or strips of bark in different spots are shed and the underlying area changes from green to another colour. This process also means that no two rainbow eucalyptus trees look the same. The tree is often referred to as a "living work of art". Like many other eucalyptus trees, the rainbow eucalyptus grows quickly and may become very tall. The mature tree may reach a height of 100 to a 150 feet in its native habitat—or even taller—but only 60 to 80 feet in other areas. The mature trunk is six to eight feet in diameter. 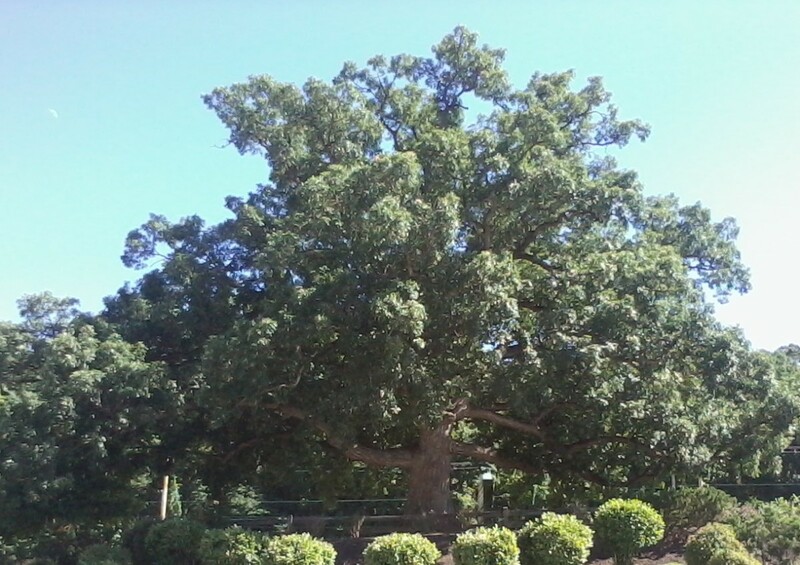 The spread of the tree is 60 to 125 feet. The tree produces white flowers and has moderately wide, evergreen leaves. The leaves contain glands that produce an aromatic oil. They release a pleasant scent when crushed. They make much less oil than the leaves of some other species of eucalyptus, however, and aren't used for the commercial production of eucalyptus oil. In the Philippines, the tree is harvested for pulp wood to make paper. The flowers of rainbow eucalyptus and its relatives are unusual. They have no petals or sepals. They do have stamens and a pistil, however. The stamens are the male reproductive organs and the pistil is the female organ. The flower buds take the form of a capsule containing the stamens and pistil. The capsule has a conical lid called an operculum. As a bud matures, the operculum becomes dark and wrinkled. When the bud is ready to open, the stamens expand, pushing the operculum off the top of the capsule. The stamens and the pistil then emerge from the bud. The numerous stamens look like tassels and surround the single, green pistil. After pollination and fertilization have taken place, the capsule becomes a woody fruit, which contains the seeds. The fruits are often known as gum nuts (or gumnuts). Pollination is usually carried out by bees. The name "eucalyptus" comes from two Greek words—"eu", which means well, and "calyptos", which means covered. The name refers to the fact that the operculum covers the stamens and pistil. Eucalyptus leaves are leathery and hang from the branches. 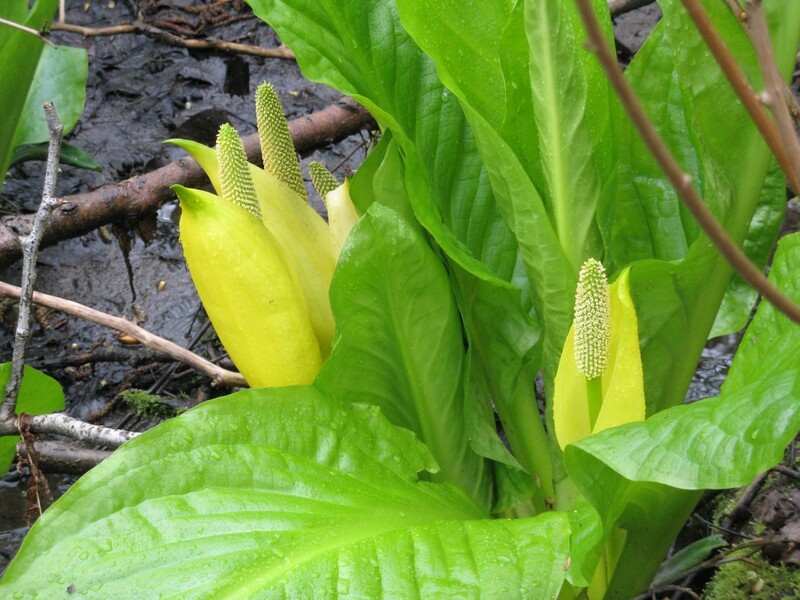 They are often long, narrow, and spear-shaped, although some species have wider and more rounded leaves. Some species of eucalyptus produce copious amounts of oil, which is volatile as well as aromatic. When a large number of trees grow near each other, the evaporated oil sometimes forms a mist in the air. Eucalyptus oil may have some health benefits, including opening up the airways in people with breathing problems. More research needs to be performed in relation to its possible benefits, however. 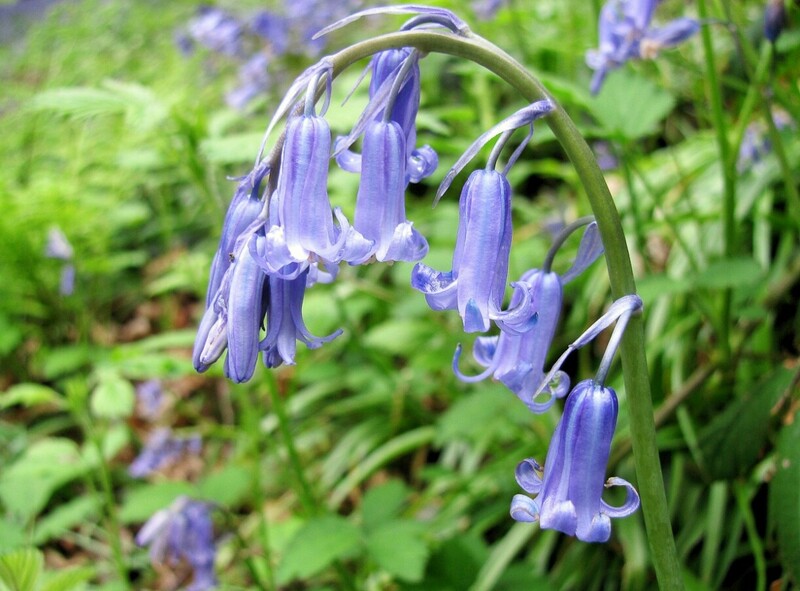 In addition to being used as a medicine, the oil is used as an insecticide and a fragrance component. Eucalyptus oil must be sufficiently diluted before use. The concentrated form is dangerous if it's taken internally or if it comes into contact with the skin. The active ingredient in the oil is known as eucalyptol or cineol. Eucalyptol is a useful but potentially toxic chemical. 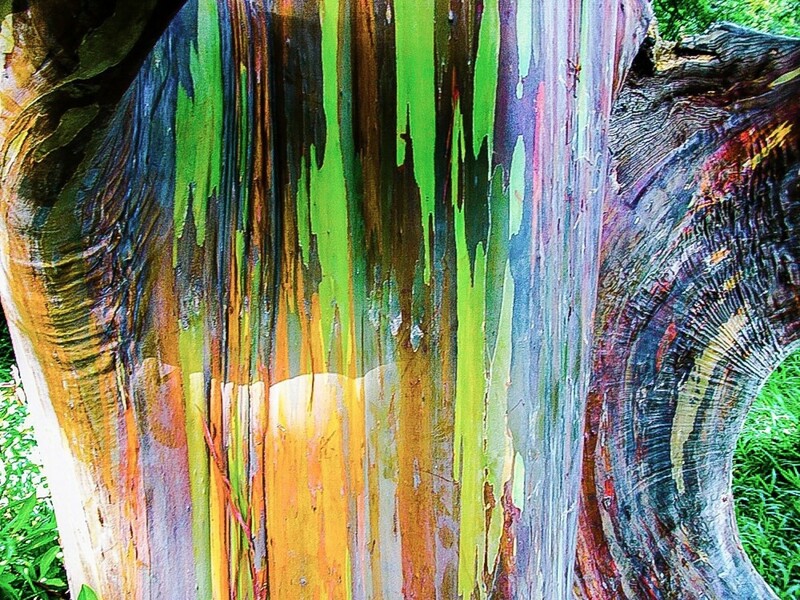 Why Does the Rainbow Eucalyptus Have a Colourful Trunk? The beautiful and often awesome colours produced by the trunk of the rainbow eucalyptus attract a lot of attention. Very little work has been done to discover why the different colours are produced, however. Professor David Lee is a botany professor at Florida International University who has explored the production of colour in plants. Based on a brief investigation, he has come up with a tentative theory to explain the colour change in the rainbow eucalyptus tree trunk. According to Professor Lee, the trunk produces a succession of thin, smooth barks. Each layer of bark is covered by a thin, transparent layer of cells which allows us to see the chlorophyll stored in the cells underneath. Chlorophyll is the green pigment that traps the light energy used in photosynthesis. As the surface of the trunk ages, the transparent cells on the top of the outermost bark layer become filled with pigments called tannins. Tannins may be yellow, brown, or red in colour, depending on the type. The combination of different amounts and kinds of tannins and a reduction in the amount of the underlying chlorophyll may be responsible for the varying colours seen on the trunk of the rainbow eucalyptus. The coloured part of the rainbow eucalyptus bark is eventually shed in strips, revealing a new green layer underneath. The process of tannin accumulation and chlorophyll reduction is then repeated. The shedding of the bark may reduce the growth of plants and parasites on the tree's trunk. Rainbow eucalyptus trees are an impressive landscaping element. 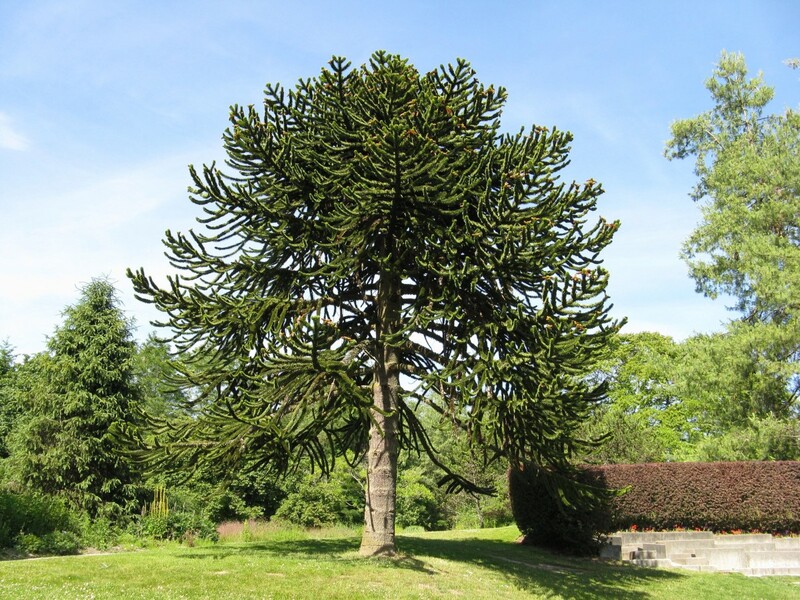 If they're used as an ornamental tree they should be planted in an area where their trunks will remain visible and where there is lots of room for them to spread up and out as they grow. 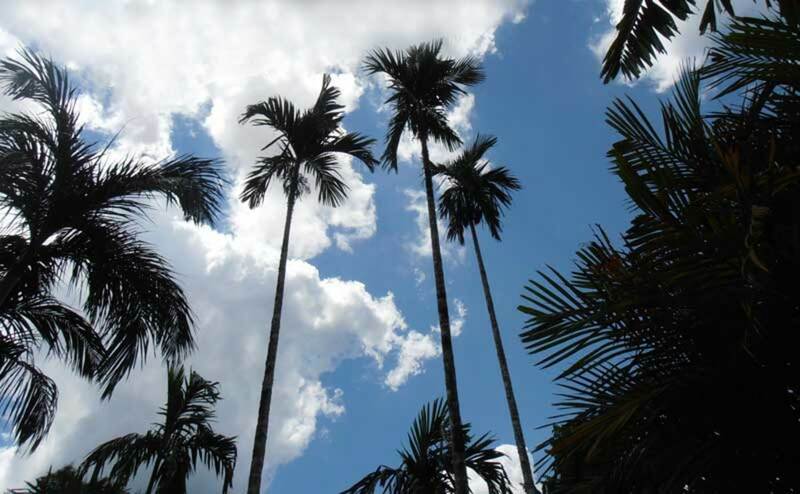 The trees need a warm environment and do best in a tropical or subtropical climate. Cultivated plant experts say that they should be planted in USDA Hardiness Zones 9 to 11. The trees may survive one night of light frost, but they are frost-intolerant plants. Repeated or heavy frost will kill them. The trees require a lot of water as well as warmth. Rainbow eucalyptus is sold as a young tree in a pot or as seeds. The seeds are tiny and may be difficult to handle. In some places rainbow eucalyptus grows in botanical gardens, enabling people to admire the plant without growing their own tree. The rainbow eucalyptus may grow as much as three feet in a year. It's said to live from 50 to 150 years and to be deer resistant. There are some drawbacks to growing the trees. They can be messy because they frequently shed strips from their bark. They can also reach a large size and take up a lot of space. Their widespread roots may damage buildings and roads. Another problem is that it's impossible to predict how colourful a particular tree will become as it matures. The colours that the trunk develops may be disappointing. Someone who wants to grow a tree should look at the colours that tend to develop in their part of the world, either in real-life specimens or in photos. This doesn't guarantee that their particular tree will develop similar hues, though. For some lovers of rainbow eucalyptus, the disadvantages of growing their own tree are not a problem. For them, the potential beauty of the tree makes having one on their property very worthwhile. Are the rings of a cross section colorful as well? Unfortunately, no. The bark of the tree can have beautiful colours, but the inner wood is much like that of other trees and is white in colour. A multicoloured cross section would be an interesting and lovely sight! At what age do the Rainbow Eucalyptus' bark colors become obvious? People who grow rainbow eucalyptus in North America say that the trees don’t develop a coloured bark until they are about three years old and the trunk is about two to three inches thick. The time when the colours appear may vary based on the climate and the growing conditions, however. I live in a USDA zone 9. We get a couple of snowy and frosty days a year. Would a rainbow eucalyptus likely survive this environment? Is there anything I could do to protect it? Can rainbow eucalyptus grow in zones 8b and 9a? How big is the root system of the rainbow eucalyptus? The rainbow eucalyptus has a spread of up to 125 feet, so it should be planted at least 60 feet away from a building to allow for this spread. 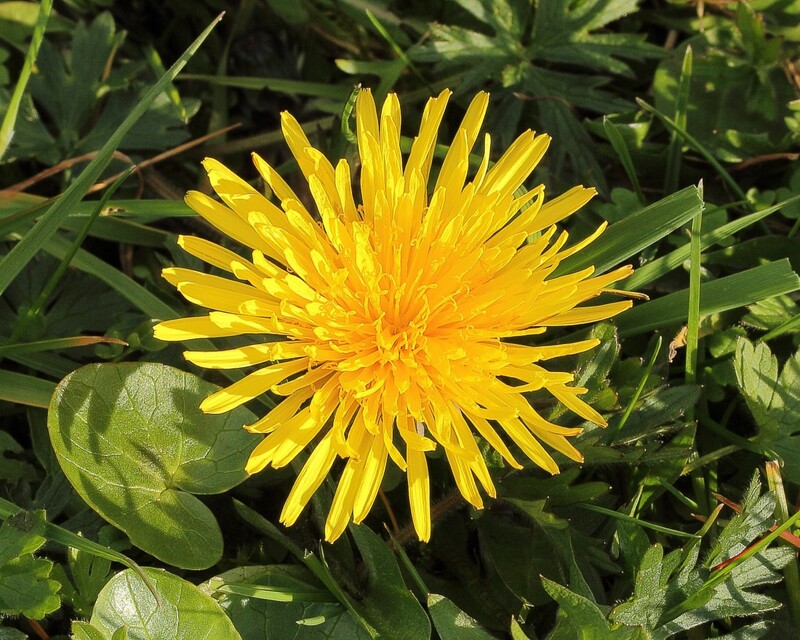 Some sources recommend that it be planted at least 40 feet away from a building. 40 feet may be okay, but it’s a little risky. The problem is that there’s no way to know for certain how big a particular tree will grow. If there’s room in a garden, it’s better to allow some extra space in case the tree becomes large, and its roots spread a long distance from the trunk. 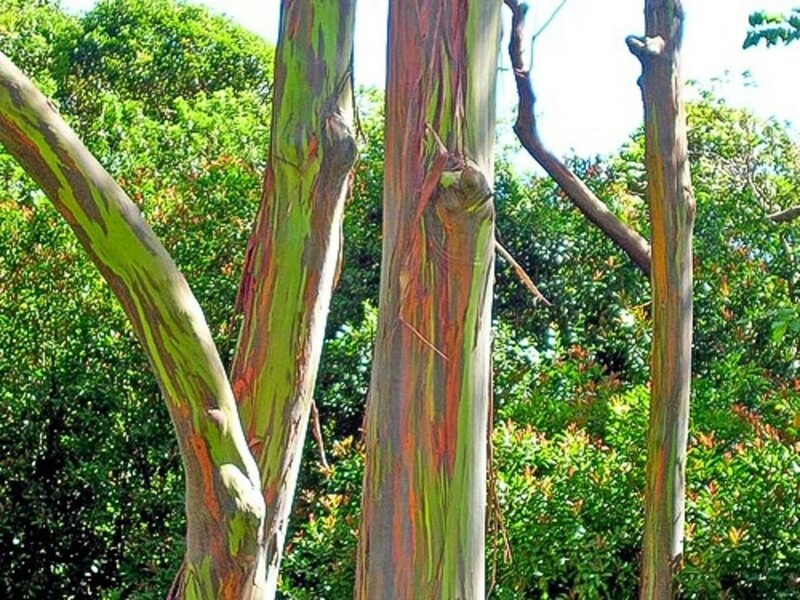 Is rainbow eucalyptus invasive and can it be planted near a pond? I can’t say whether the tree is invasive in your area because I don’t know where you live. You would have to contact your local authorities to find out. I have read that it’s considered to be invasive in some parts of the United States. The tree does need a lot of water, but you should probably contact an expert at a garden centre to see if placing it near a pond is the best location for the pond as well as the tree. Does the rainbow eucalyptus make fruits? Yes, as I mention in the article, rainbow eucalyptus produces fruits known as gum nuts or gumnuts. They are brown and woody when ripe and bear a variable number of seeds. Wow! That is so cool. I never even knew about this, until now. Thank you for sharing Linda! Yes, that's one thing that makes life so interesting! Thanks for the comment, Ziyena. That's an interesting way to describe the colour pattern on some of the trunks! Hi, Willow. As I say, the rainbow eucalyptus requires a warm environment and moist soil and is intolerant to frost. 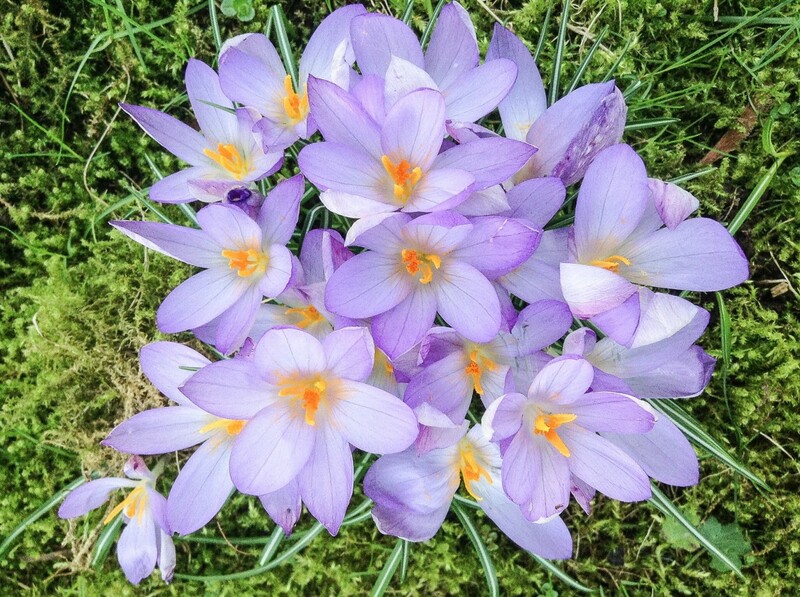 According to the Missouri Botanical Garden reference, it's winter hardy to USDA zones 10-11 and does best in full sun and in a medium to wet, rich soil. What about the habitat? Not a lot info about that. Thank you very much for the congratulations, Alun. I appreciate your visit and comment a great deal. I hope you do eventually get to see a tree in real life! That is one amazing tree Linda! A lot of Eucalyptus trees have attractive bark but this is so colourful, as you say, it almost looks artificial. But the video shows the colours in all their glory, and the video and the text shows and explains how the colours are produced and change as each layer of bark is exposed to the air and then peels away. Very interesting, and I certainly hope to get to see this tree live one day. Thank you very much for the kind comment, Scribenet! 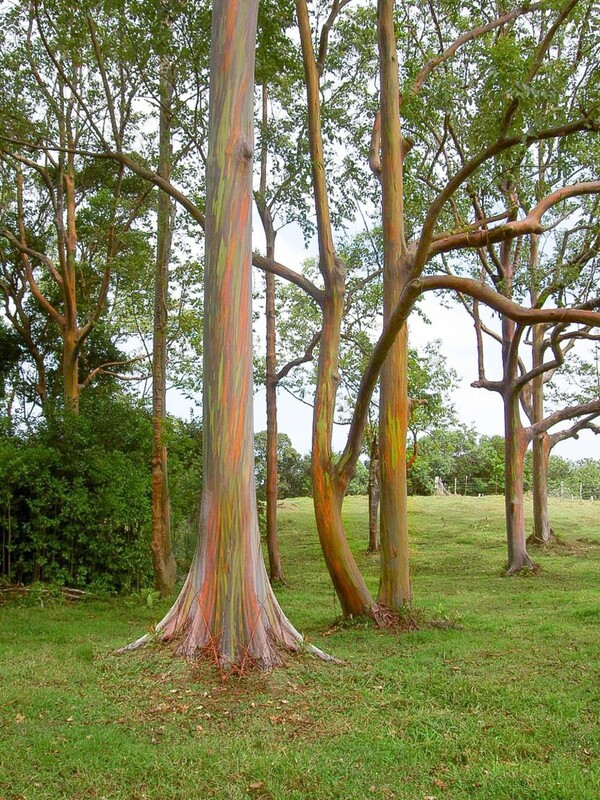 I agree - the rainbow eucalyptus is an awesome tree. This is another awesome tree. Too bad they are only tropical. I just learned something new. Great Hub! Thank you very much for the lovely comment, Audrey. Wow! What a beautiful tree, and beautiful hub! Thank you for the visit and the comment, lyoness913. Thank you for the comment and the congratulations, Thelma! I appreciate the votes as well. I'd love to see a photo of your bonsai rainbow eucalyptus, hostaguy! Thank you very much for the kind comment. Congratulations on the HOTD! A very informative hub. Voted this up and awesome. Thanks for the heads up. Thanks, DLeighAlexander. I appreciate the congratulations! What a beautiful tree! 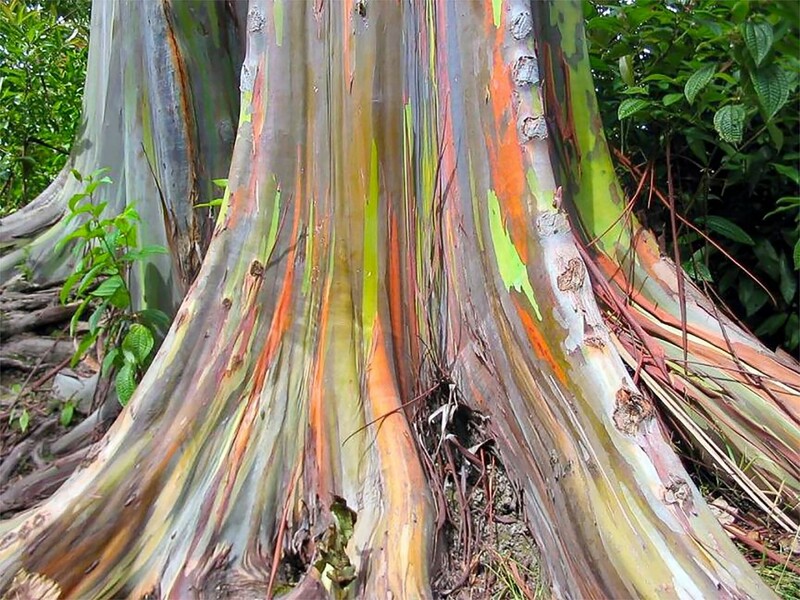 I had never heard of this tree before and enjoyed learning about it--your pictures are fascinating and the Rainbow Eucalyptus Tree is a gorgeous part of nature. Thank you very much for the kind congratulations and the comment, Bill. Congratulations Linda. What a beautiful tree, never seen anything like it, just amazing. Well deserved HOTD. Hi, RoadMonkey. It would certainly be lovely to have a rainbow eucalyptus tree in a garden, as long as the garden was big enough! Thanks for the visit. What a shame they wouldn't grow here - too cold. I would love to have one of these. Thank you, Tricia. I think the rainbow eucalyptus is unusual and beautiful, too! What an unusual and beautiful tree. Nature sure has its surprises. I learned something new today. Thank you. Thank you very much, vasanthatk. Amazing pictures and the write up too. Voted up. Thank you, Kristen. I appreciate your comment and congratulations very much. Thank you very much, zeenat. Alicia, although I've commented on this hub awhile back, I wanted to congratulate you for the HOTD, too! I still loved this hub. wow, its interesting.... I had no idea that colorful eucalyptus tree also exist. looking soo beautiful... Thanks for sharing this knowledge. Thank you for sharing your experience, My Bell. I appreciate your kind comment and your vote, too. Thank you very much for the comment and the congratulations, colorfulone! Thank you for the congratulations and the second visit, Heidi! I appreciate your comment very much. Thank you very much for your comments, whonunuwho! I appreciate your visit. I saw these beautiful trees on a trip to Maui with my husband. They smelled so good too! Congrats on this HOTD that is very well written and has beautiful pictures! An up vote from me. Nice to see this beautiful hub as HOTD. Thought this was one of the most interesting and beautiful hubs when you first published it. Definitely deserving of Hub of the Day! Congrats! Hi, RTalloni. Thank you for the congratulations. I love your idea about the benefit of a rainbow eucalyptus tree! 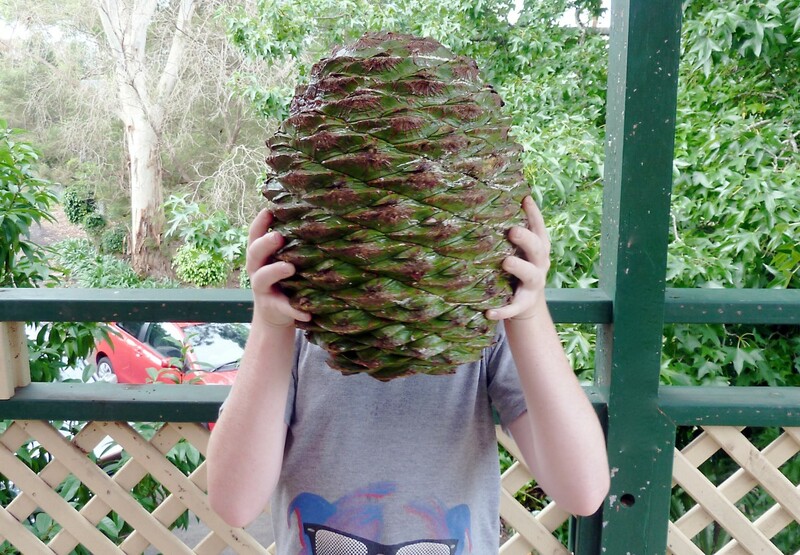 Congrats on your Hub of the Day award for this neat post on an amazing variety of eucalyptus. Growing one would indeed be worthwhile. I would love to own on for a lot of reasons, but one of the best would be to let it inspire me to write children's stores. Thanks for highlighting it for us with interesting info. Thank you very much, Bill. I appreciate all your support. Just stopping by again to say congratulations on the HOTD. Well-deserved! Thank you for the comment, votes and shares, Mary! I appreciate them all. Thank you very much, Susan. The rainbow eucalyptus is definitely photogenic! It's a beautiful tree. Hi, Peg. They are certainly amazing trees! Thank you for the congratulations. Hi, Cyndi10. Thanks for the comment, the congrats and the vote. I appreciate your visit. Thanks for the congrats, Faith. I hope you have a great week, too. Thank you very much for the comment, stevbonhage. Thank you very much for the return visit and the congratulations, Flourish! Congrats on HOTD! This is certainly a beautiful tree. If it likes warm weather, I wonder is it would grow in S. Florida. I'll have to research that a little more. I watched the interesting video. Boy, talk about tiny seeds!! Voted this one UP,etc. Will share here and on my "Tree" Pin board. The rainbow eucalyptus is beautiful, interesting, and so very photogenic! Very interesting read. Congratulations on HOTD honors today! When I first saw these photos I couldn't believe they were real. The appearance of the bark of the Rainbow Eucalyptus tree is amazing, almost cartoonish with its vibrant coloring. This was interesting to learn. Congratulations on the Hub of the Day award! Congrats! Great article. I have to echo what others have already said, I had no idea this tree existed. You have packed a lot of information about the tree in your hub. It makes you want to travel to the Philippines to see it or Indonesia to see it. Voted up. Congrats on the HOTD! Well-deserved as always. I'm back to say Congratulations about HOTD! Well done! Thank you very much for the comment and the vote, Besarian! The colors are stunning! I had no idea this tree existed. Thanks for introducing it to me. Voted up! Thank you very much, Kristen. I appreciate the comment and the vote! Way cool and awesome hub. So unusual and pretty at the same time. Voted up! Thanks for the visit, Rota! I hope you find a rainbow eucalyptus one day. Gosh, what a pretty tree. I don't think I've ever seen it here in Australia. But I will definitely be on the lookout for it from now on! Thank you very much for the kind comment, Deb! I found this both remarkable and filled with much knowledge. Thanks once again for piquing my curiosity and answering so many questions. Thanks for the comment and the pin, Peggy! I agree - the bark does sometimes look like an abstract painting. It's certainly beautiful. The closeup photos of that bark almost looks like an abstract painting. Beautiful colors! Pinning this to my trees board. Interesting hub Alicia! Thank you very much, Vellur. I love the smell of eucalyptus, too! Great hub about the Rainbow Eucalyptus. The peeling bark is really beautiful. The smell of the leaves are so refreshing. Thanks, Flourish. I guess in some places people are used to the colours and also need to make money. It would be hard for me to see a rainbow eucalyptus destroyed, though! Great hub! It looks like someone splashed paint on it. How unfortunate that they're simply harvested for paper. Thank you very much for the lovely comment and for the vote and share, Patricia. I appreciate your visit and the beautiful angels that you send. I would be constantly looking at my rainbow eucalyptus if I had one in my garden, too! How cool is that. If I had one in my yard I fear I would be so by it that I would never do anything but adore it. Hi, vespawoolf. I hope you are able to see a rainbow eucalyptus in real life one day. It certainly is a lovely tree. I´d never heard of this tree until reading your Hub. Eucalyptus trees are common in the Andes mountains of Peru, but I´ve never seen this variety. How beautiful! I hope to see it in person someday. I agree, poetryman6969 - it's a lovely photo of a particularly colourful tree. Thanks for the visit. That first photo is particularly fetching. How lovely! Hi, Shades-of-truth. 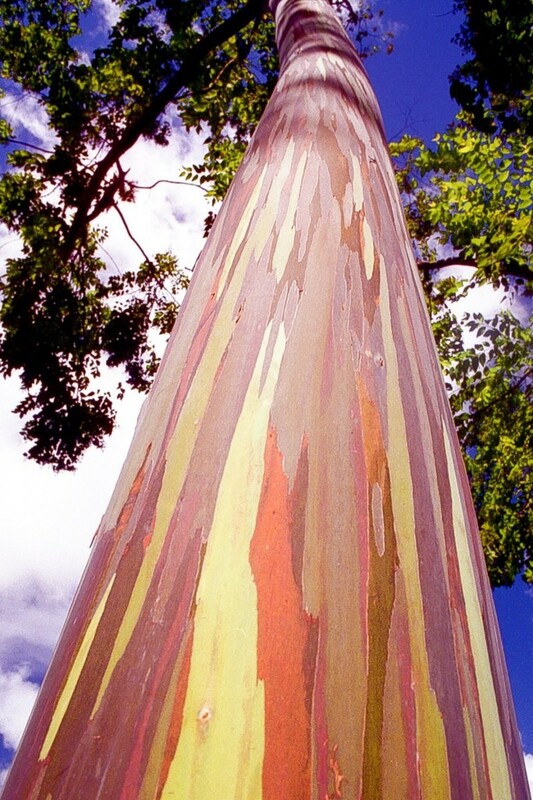 I went to Hawaii many years ago, but I don't remember seeing a rainbow eucalyptus tree. I'm sure I would have photographed it if I had! Thank you very much for the comment. Thank you so much for the comment, the vote and the share, ologsinquito! The rainbow eucalyptus would certainly be a beautiful ornamental tree. I'd love to be able to grow one. Wow! I have not been to Hawaii, but my husband has. I am going to ask him if he saw these spectacular trees when he was there. Gorgeous article! That tree shown in the video is amazing. These would make beautiful ornamental trees if you live in the right type of climate. I can see why people would want them. Great article. Voted up and shared. Hi, Pamela. I agree - it is a gorgeous tree. It's been introduced to Hawaii, Florida and California and also grows naturally in countries near Australia, so you may not have to travel far to find a tree. I think the journey would definitely be worthwhile! Thank you very much for the comment. I think this is a gorgeous tree. I never saw a tree with a trunk so beautifully colored. I obviously need to travel to Australia! This was a very interesting and hub loaded with beautiful pictures. Hi, hostaguy. It would be wonderful if a rainbow eucalyptus could grow as a bonsai tree! Thanks for commenting. Hi, Lady Fiddler. Yes, the tree is very beautiful! Thank you for the visit. I appreciate it. WAW!!! The things God has created is so awesome for the eyes to see. That tree looks so beautiful as it sheds it skin/bark "pretty isn't it"
Hi, firstday. Yes, the rainbow eucalyptus trees with the vivid colours are truly amazing. I like the ones with the palers colours, too. I think they're so pretty. Thank you for commenting. Yes, that's a definite benefit, Fred! Someone recently posted a picture of one of the Rainbow Eucalyptus Tree on TSU and I could not believe my eyes. Thanks for your posting so we can enjoy this tree. The trees are beautiful and amazing to me, too, colorfulone. I appreciate your visit and comment. Hi, Heidi. I agree - the tree is a natural wonder! Thank you very much for the votes. I have been seeing more and more about the Rainbow Eucalyptus Trees on Facebook in the past year. They are beautiful and amazing to me.